A 4.30am rise this morning and a drive along the A35 to Lyme Regis hoping for the right conditions and that the Met Office had as usual got the forecast wrong. As I drove through heavy fog I tried to remain positive telling myself that it would clear out as I arrived on scene, how wrong I was and how right the Met Office were for once. 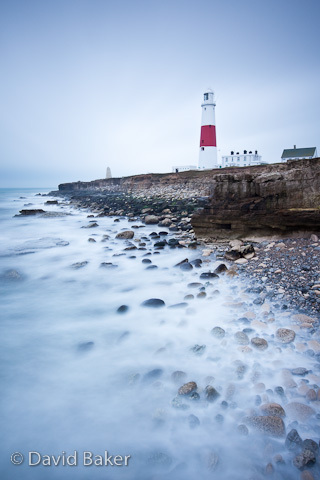 Undeterred I shot what I could, knowing deep down that I wouldn’t be happy with the results and after a belly filling ‘full English’ breakfast I substituted the fog and rainy weather of Lyme Regis with much the same a bit further down the coast at Portland Bill. After a 20 minute wait I got lucky the rain stopped, a frantic few moments followed while I rushed to get set up, praying that I would get something from the day, the fun lasted no more that 15 minutes before the rain returned. To be honest I’m not sure how long my ears would have coped with the fog horn blasting out from Portland Bill anyway! The image that I came away with was once again down to the Lee Filters Big Stopper and the 92 second exposure it gave me, just long enough to blur the raging sea and to add some interesting light to the foggy back lit sky. ~ by David Baker on 19 March, 2010.